It’s time to get those bumps looking good for summer! but more importantly, keep you and bub super healthy throughout your pregnancy and beyond. During pregnancy, our body gradually changes due to the increase in hormones. Therefore, keeping strong, flexible and maintaining or improving overall fitness is very important for your body to manage these changes. This depends greatly on your starting point. The ACOG guidelines state ‘an exercise program that leads to an eventual goal of moderate-intensity exercise for at least 20-30 mins per day on most if not all days of the week’. If you have just started to exercise in pregnancy, we would advise you gradually build up to this over a period of time. We encourage women to get into some type of exercise during pregnancy, even if they have never exercised prior pregnancy. Yes, you read that correct! you can start to exercise during pregnancy even if you have never exercised prior, under the guidance of a women’s health physiotherapist. 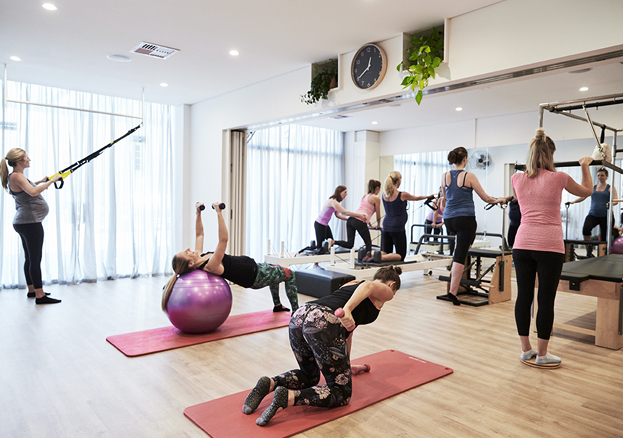 If you have been exercising prior pregnancy, we do advise seeing a women’s health physiotherapist go through a thorough evaluation of your current program to make sure it is appropriate. “You haven’t mentioned running or other high impact exercises”, is what you’re thinking….You can continue with high impact sport if you were doing it regularly prior pregnancy, however, I believe pregnancy is such a short period in a women’s lifetime, that staying off the high impact exercises and trying different forms of pelvic floor safe exercises, to decrease the risk of incontinence and prolapse… what’s a what?… prolapse?… that’s another blog! At Women in Focus, we offer pregnancy Pilates classes. They are a great way to strengthen your body, prevent or reduce rectus abdominal diastasis, to prepare you for late-stage pregnancy, birth and being a mum… ekkkkk… The classes utilise a combination of Pilates and functional strengthening exercises, specifically designed to target the pelvic floor, deep abdominals, back and buttock muscles. I recommend asking your G.P, midwife or obstetrician on your next review, ‘do I have any medical issues, that would affect me participating in exercise?”, as there a small population where exercise is not advised. Let’s get moving ladies so that shaving your legs, getting out of bed and managing that trolley which has a mind of its own continues to stay easy.